Thanksgiving is perhaps my favorite holiday. Somehow, despite the ever-increasing prevalence of corporate influence in our lives, Thanksgiving has managed to remain relatively un-commercialized. Sure, sure, I know that Black Friday is the unofficial start to the madness of holiday shopping. But for one glorious day, we eat, we enjoy family, let the ladies cook for us (if we're lucky), and watch football. If we can muster the energy, we even get outside to throw the ball around a bit with the boys. So here's something else to be thankful for: It looks like a beautiful riding weekend! Tomorrow is going to be a little chilly in southern California, but will be in the 70s throughout the weekend from San Diego and Orange County to Long Beach and Los Angeles. As for your Northern California bikers, after a little rain in the Bay Area tomorrow morning, it looks like sunny skies for the rest of the weekend. Just like with any other holiday weekend, however, motorcyclists need to be aware that too many people have too much to drink before getting behind the wheel. Be careful! And please don't be one of them. Cops are going to be out in full force, and far worse than a costly DUI is a motorcycle accident that can impact your wallet, your health, your life, your job, and your family. Don't drink and ride! 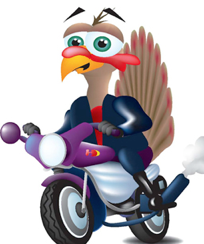 Make it a Happy Thanksgiving by Riding Safe!